Wear of particles often induces undesired phenomena like loss in product quality and formation of fines or dust. We have different research set-ups for studying wear of solid particles by means of attrition and/or abrasion. 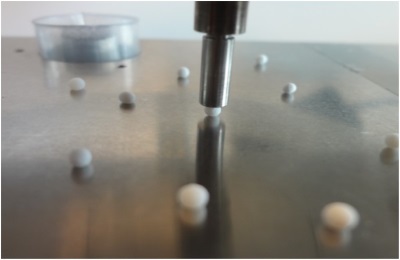 A straightforward approach for larger entities is the tablet hardness tester that measures the crushing strength in axial or radial direction of a single pellet and tablet. This approach does not work for smaller entities and therefore we have developed the robotic compression tester that is able to measure the individual crushing strength of particles as small as only a few 100 micrometers. When studying particles in bulk, different approaches are available depending on the actual application: bulk crushing strength that measures the fines created during stress at different consolidation pressures, breakdown of granules or pellets by attrition in a rotating drum quantifying the fines achieved, attrition of smaller entities in a repeated impact test thereby mimicking attrition during pneumatic transport and fluidisation attrition that is applicable to wear due to particle-particle collisions in fluid bed installations.